Is Shopify's Secondary Share Offering a Red Flag? The company is growing its war chest at the expense of its shareholders. Shares of Shopify (NYSE:SHOP) plunged 13% on Dec. 14 after the e-commerce services provider priced its previously announced secondary share offering. The company will sell 2.6 million new Class A shares at $154 apiece to raise about $400.4 million. Shopify will use the proceeds to fund its growth strategies and strengthen its balance sheet. But should investors consider the dilutive offering, equivalent to roughly 3% of Shopify's float, to be a red flag for its stock? Shopify's revenue growth is decelerating and it remains unprofitable on a GAAP basis. Its revenue rose 58% annually to $270.1 million last quarter, but that marked its slowest growth rate since its IPO three years ago. Its GAAP net loss widened from $9.4 million in the prior-year quarter to $23.2 million. On a non-GAAP basis, which excludes stock-based compensation (SBC) expenses and other charges, its net income dropped from $5 million to $4.5 million. Shopify finished last quarter with $1.58 billion in cash, cash equivalents, and marketable securities, compared to $938 million at the end of 2017. However, that position was significantly boosted by another share offering in February, which raised nearly $660 million by selling 4.8 million shares. 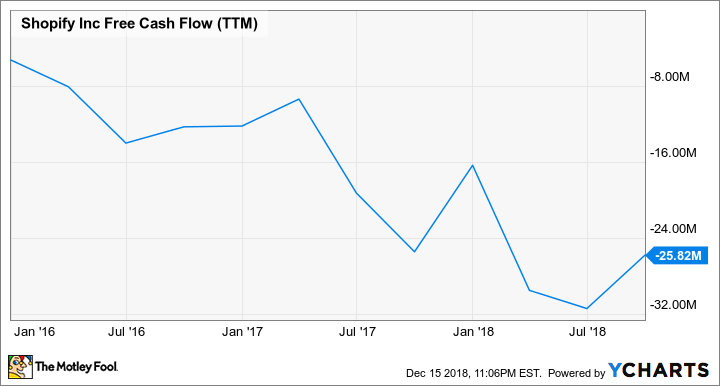 Meanwhile, Shopify's free cash flow (FCF) remains negative. SHOP free cash flow (TTM) data by YCharts. Shopify is raising cash as it faces tougher competition from Adobe (NASDAQ:ADBE), which acquired main rival Magento and the marketing firm Marketo earlier this year. Adobe is bundling services from Magento and Marketo with its other marketing, advertising, and analytics tools in its Experience Cloud platform. That competition forces Shopify to aggressively expand its own ecosystem, but throttles its ability to raise prices -- so it could keep burning through cash as its sales growth decelerates. That brings us to Shopify's current price and valuation. Its stock rallied nearly 500% over the past three years and remains up nearly 40% for the year. It trades at about 10 times next year's sales and over 200 times next year's non-GAAP earnings. Adobe trades at 10 times next year's sales but just 30 times forward earnings. Shopify raises more cash by selling its secondary shares at higher prices, so it makes sense to launch these secondary offerings before its stock tumbles. Shopify still has a first-mover advantage in its niche market, where it helps businesses design, set up, and run online stores. This includes tools for building websites, processing orders, payments, and shipments, as well as launching marketing campaigns, building customer relationships, and gauging a business' long-term performance through analytics. It also offers small business loans through its Shopify Capital unit. Shopify is leveraging that market-leading position to expand its ecosystem with new services to lock in customers, boost its revenue, and widen its moat. It's aggressively expanding its Shopify Plus platform for higher-volume merchants, integrating its platform into third-party apps via APIs, and establishing a presence in overseas markets. It also launched a first-party App Store to help merchants prioritize mobile purchases -- which accounted for 77% of all traffic and 67% of all orders last quarter. Simply put, Shopify's secondary offerings could be justified if they help it expand its ecosystem. The company could also be raising $400 million to fund a major acquisition. Shopify's growth is decelerating, it faces tougher competition, it's unprofitable, its FCF is negative, and its stock trades at high valuations. It also uses a dual-class share structure, which tells retail investors -- who hold the Class A shares that are being diluted -- that their stakes don't matter. I like Shopify's business model and I think it has great long-term growth potential. But I don't like its stock at these multiples, and the secondary offerings indicate that it's more interested in cashing in on the stock's big rally than boosting shareholder value. Therefore, I'd avoid this high-flying stock until the dust settles. The Smartest People on Wall Street Are Buying These 3 Stocks -- Should You Follow?